Property Location Located in Osage Beach, Hawk&apos;s Nest Lodge is convenient to Gran Rally Karts and Osage Beach Premium Outlets. 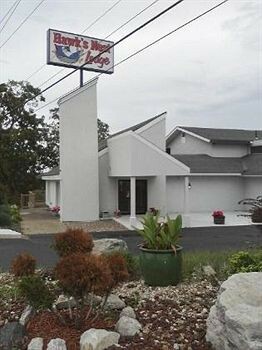 This inn is within the region of Ozark Caverns and Ozarks Caverns Visitors Center.Rooms Make yourself at home in one of the 26 air-conditioned guestrooms. Complimentary wireless Internet access keeps you connected, and cable programming is available for your entertainment. Bathrooms have shower/tub combinations and hair dryers. Conveniences include desks and coffee/tea makers, and housekeeping is provided daily.Rec, Spa, Premium Amenities Take advantage of recreation opportunities such as a seasonal outdoor pool, or other amenities including gift shops/newsstands and a fireplace in the lobby. Additional features include a television in the lobby, a picnic area, and barbecue grills.Dining A complimentary continental breakfast is served on weekends.Business, Other Amenities Featured amenities include multilingual staff and coffee/tea in the lobby. Free self parking is available onsite.